Having originally, and successfully, released on the PlayStation 4 and the Xbox One back in January, the PC version of the latest Monster Hunter is now here. Having been very well received by fans and critics alike, Capcom has taken the time to get the PC version just right and while it may have taken some time to release, it's been worth the wait, because this game is damned pretty! I’ll be honest that I’ve played the living hell out of Monster Hunter when it first released. Since then it’s been an on and off affair while waiting for updates to bring in some new content like the permanent Final Fantasy crossover event launching this week. Why does that even matter you may ask? It matters because after getting the chance to dive into the PC version, I’m unsure about returning to it on my PS4. 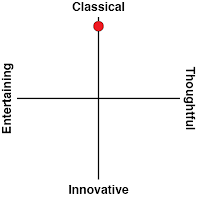 As someone that does prefer to play my games on console, that says a lot. The biggest reason for the wait on the PC version has been to make sure that this port was not only done right, but done in such a manner that would be befitting of the full capabilities that the PC enables. Unlike the closed environment of the PS4 or the XB1, PCs are much more customisable and it’s easy enough after a few upgrades or throwing down for a brand new rig to have stellar performance and incredible visuals. Monster Hunter World on a PS4 Pro on a 4K TV doesn't even compare to diving back into this open world of monster hunting on even a mid to high level PC, much less the other super machines out there. So for the few that haven't been following along... what is Monster Hunter World? 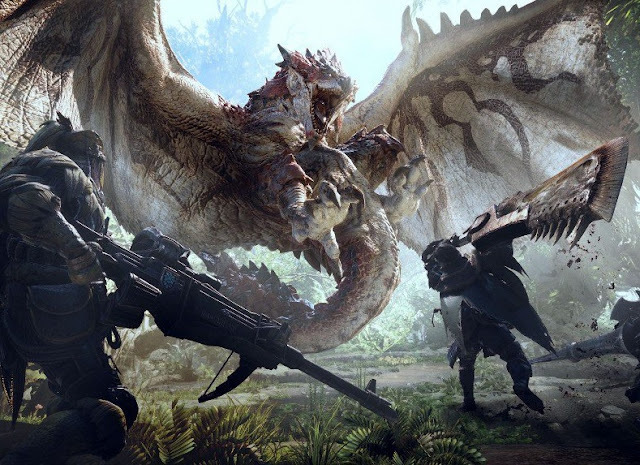 Monster Hunter World is the latest in the once niche series by Capcom that was specifically designed to be more accessible and easier to get into. The core premise is that there are large monsters out in the wild and it's your job to hunt them down. Yeah, okay, the series has never been about telling stories, but while this is still the overall case, Monster Hunter World does introduce a storyline more substantial than normal to string along your set of quests as you head out into the wild for both adventure and spectacular combat. Monster Hunter is in no way an RPG, contrary to what many think going in. It’s strictly a action/ adventure experience that has you fight against monsters that get harder and harder as you explore the land. In order to face off against these more powerful beings, you’ll have to craft better gear. How do you obtain this gear? By taking out the monsters that are currently on or slightly above your level and then getting the blacksmith to make new pieces or upgrade current ones through the parts of those beasts that you sever or break off while out hunting. This is why have to face off against the same type of beasts time and time again, especially for the more rare materials. Yes, some people might find that a tedious process. Oddly enough, it's not possible to trade materials with other players; the onus is on you to collect the materials yourself. Despite that, multiplayer is a big part of the Monster Hunter experience. While it is possible to play the game solo, it’s a lot more fun in a team and groups of up to four people can be formed to head out and hunt was is needed. Another thing that has always made this series interesting and enjoyable are the many options that the player can use when it comes to how they wish to hunt a monster. The weapons themselves come in the form of swords, axes, giant two handed weapons, bows, glaves, guns, and plenty more besides. There's 14 different weapons. It's more than enough for everyone to find one. While each of these weapons start simply doing normal damage, as you get more monster parts to play with, customisation options will open up to you, and you may decide that you wanted a weapon that inflicts additional fire, poison or ice damage. Most players end up with one particular weapon they prefer, but while you may only have one weapon at a time, nothing stops you from heading back to your camp and swapping out if things aren’t going so well. Being prepared is one thing, knowing when you have to change it up is another. Another adorable feature is the Palicos. Palicos are a species of bipedal felines that inhabit the world alongside humans. Every player has one, and also has the option to forge them a weapon, armor and helmet set to better equip them as they head out into the wild alongside you. So when you find another Palico out in the field, it could be a wild one or it could be that of another player, but more often than not, it will be the Palico of one of your friends off of your list. These “wild” Palicos will join up with you alongside your own faithful companion for as long as you are out and about. 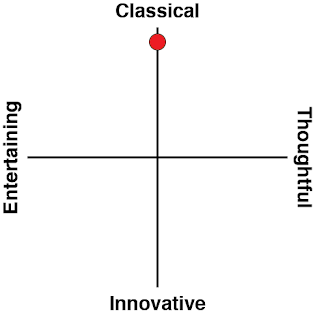 It's a really neat way to include some asymmetric multiplayer in there, and make your solo campaigns that little bit easier. Regardless of where they come from though, Palicos are useful as they can pick up items or in combat can pull a monster's attention off of you, deal some damage and sometimes even sever parts of a monster off all by themselves. You can use them strategically to hit things that you can't by giving them a different weapon set (for example, ranged weapons while you focus on melee). They even have inflatable rafts to keep dry as you take to the water! As for multiplayer itself, it can be a bit tricky at times when a player in question is in their story mode. Each new section of the story has to be started off on your own until a cutscene appears. Once the cutscene is over, the player can then send up an S.O.S. flare that will let other players join as fast as the servers will let them. This has to be one of the few issues that I have with Monster Hunter World. It would have been better for all players to be able to load in and then have all players have to watch the cutscene instead of having to wait out in “the lobby” just waiting for that green light to go off and hoping that it doesn’t take forever to make it into the game. 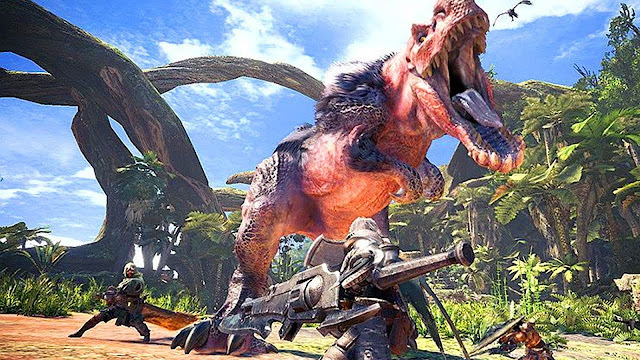 The only other real issue that Monster Hunter World has is the variety available to hunt in comparison to some of the others in the series. Monster Hunter World currently has a total of 33 Large Monsters accompanied by 18 smaller ones for a total of 51. Just looking back at Monster Hunter 4, there were 51 large monsters and 23 smaller ones, with compatible numbers in Monster Hunter 3 Ultimate. Considering that Monster Hunter World currently does not contain the G-Rank quests, you can only speculate that there is more to come, but until Capcom gives you the privilege of being able to purchase that, there’s still a little ways to go in that regard to make it into a true Monster Hunter. 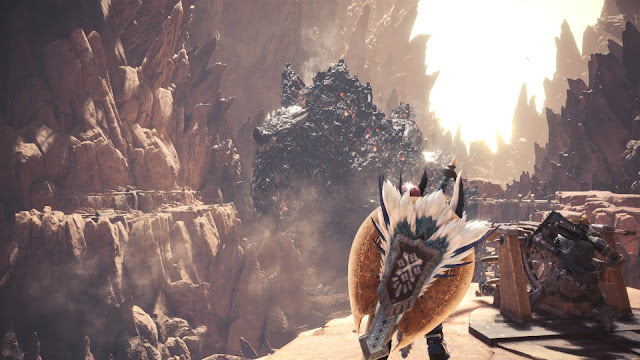 All in all Monster Hunter World for the PC is an amazingly done port. Graphics alone could be cause for some to leave the consoles behind in order to view this world the way that it really should be, but for others, it could be the start to the series that you’ve been waiting for as it makes itself easy to slide into and is now available on the PC. 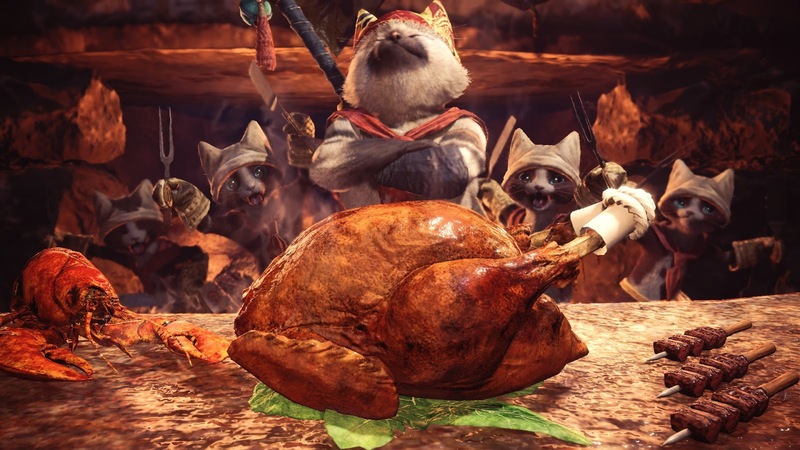 Just remember to keep your Palico’s properly equipped and eat before heading out as no one like working on an empty stomach!